Dingolfing-Landau is a Landkreis (district) in Bavaria, Germany. It is bounded by (from the north and clockwise) the districts of Straubing-Bogen, Deggendorf, Rottal-Inn and Landshut. 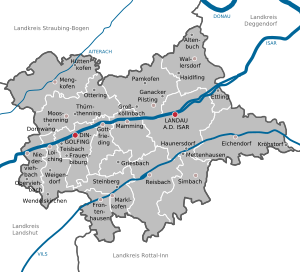 The district was established in 1972 by merging the former districts of Dingolfing and Landau (Isar). Its original name was Untere Isar ("Lower Isar"), but in 1973 it was renamed and got its present name. The region is characterised by very plain countryside and several rivers running from southwest to northeast (towards the Danube). Most important rivers of the district are the Isar and the Vils. The whole region depends on the automobile industry. At Dingolfing, you can find the largest BMW-Industry complex in the world. Wikimedia Commons has media related to Landkreis Dingolfing-Landau. This page was last edited on 24 June 2017, at 13:03 (UTC).